My 15-month-old daughter, Phoenix, is a kick in the pants. This kid has got more energy in her than I can keep up with. Of course, when she gets home from day care, she runs rampant and really wants to play, so we do. That’s not quite how it goes at our house. 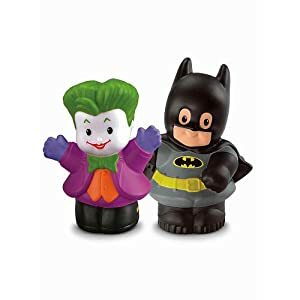 Phoenix is into Sesame Street, so we do have the Sesame Street Neighborhood Playset and figures, but she’s also into Little People, so Daddy ended up getting some figures that he could better relate to… like Batman and Joker. Travis: Hey, Phoenix, can you find Batman? Where’s Batman? Phoenix: <holding up the Batman figure> BAPMO! Phoenix: <dancing the Batman figure around on the floor> BAPMO! BAPMO! Travis: Right, Batman has to come stop the Joker. Joker is going to drive the bus away from Batman. Vroom! Vroom! Travis: Perfect! Now Batman’s going to try to stop Joker… but the Joker has a secret weapon. The shark! Watch out, the shark is going to get you! At this point, I grab this giant stuffed shark we bought at Ikea for $15. It’s the best $15 I’ve ever spent. Phoenix wrestles this shark and screams and runs and then comes back to wrestle it some more. I attack her with the shark, and she screams and giggles. Travis: Hey, Jenn, where’s the Wonder Woman figure? Jenn: I don’t know, have you looked in the toy box? Travis: Yeah, but I don’t see her. Phoe, where’s Wonder Woman? Travis: Well, crap. How am I supposed to set up the Hall of Justice in Hooper’s Store if I can’t find Wonder Woman?